Mt. Fuji is 3,776 meters high and is the highest mountain in Japan, situated in the southeast part of Yamanashi at the border of Shizuoka. With unrivaled magnificence and a beautiful cone shape, Mt. Fuji has often been selected as the subject of paintings and literature. It is world famous as a symbol of Japan. At the foot of Mt. 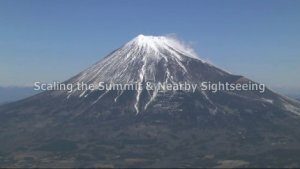 Fuji are Fuji-Goko (Fuji's Five Lakes), Aoki-ga-hara-jukai (a sea of trees that is dark even during the day), and Kitaguchi-Hongu Fuji-Sengen Shrine (which was constructed to calm the eruption of Mt. Fuji). The Fire Festival of Yoshida, held at the end of the summer as a ritual for closing the climbing season for Mt. Fuji, is one of the three most peculiar festivals in Japan.